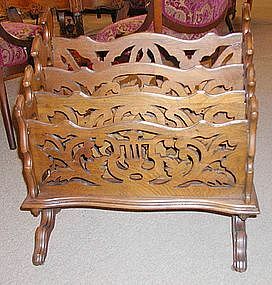 This lovely canterbury or magazine rack is all reticulated walnut, circa 1880. It measures 24" wide x 14" deep x 25" tall and looks great from all angles. 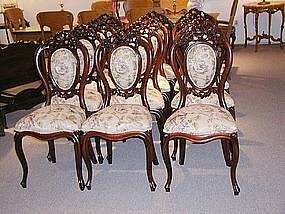 Beautiful set of twelve mahogany side chairs, all professionally reconditioned. Victorian rococo style, circa 1920. Measure 39" tall x 18" wide x 16" deep. So very hard to find a set of twelve chairs, and these are truly lovely. 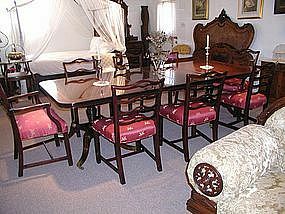 Beautiful mahogany banded dining table, Federal style with double pedestal with brass decoration and casters. Measures 44" wide x 70" long without leaves, and includes two 18" leaves so that it is 106" when fully extended. 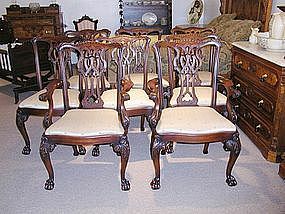 This absolutely beautiful set of American carved mahogany chairs is top of the line. They are Chippendale in style, circa 1900. There are acanthus leaves on the knees and ball and claw feet. The two armchairs measure 39" tall x 25 1/2" wide, and the six side chairs measure 39" tall x 22" wide. 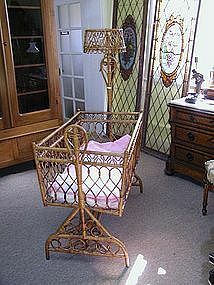 19th century Victorian American baby cradle in natural wicker having a round dome crown suspened in the frame. This beautiful cradle is in excellent original condition and measures 55" tall x 39" long x 21 1/2" wide. The actual bed part measures 37" long x 21 1/2" wide x 15 1/2" deep.